These are really easy, fast and satisfying. They’re a great project that takes very little yarn, which is good for a beginner hand-spinner. These were designed to fit a fairly average female hand measuring 7 1/2″ to 8″ around just above the thumb. Any yarn that will allow you to make gauge will do. I’ve used a combination drafted hand-spun single that is 11 WPI (wraps per inch), and looks like somewhere between DK and sport weight. I used about 110 yards, but your yardage may vary depending on the row gauge you get. 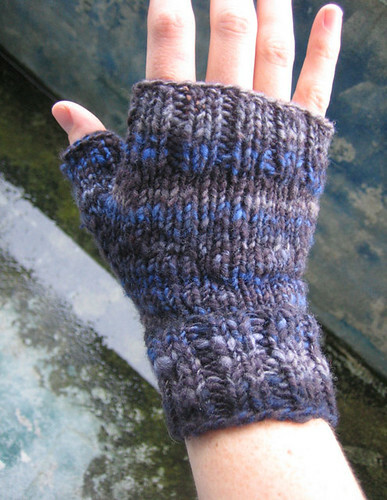 I knit these gloves on a long circular, using the magic loop method. They could just as easily be knit on double pointed needles. Now there will be 38 sts on the needles. Now there will be 34 sts on the needles. K2tog through back loops, put the stitch created back on LH needle, then K2tog tbl again, … etc. pull out scrap yarn, and put the 11-12 live loops created onto needles. Knit 7-8 more rounds even, then BO using decrease bind-off (described above). Knit second glove same as the first. Weave in ends, block if you find it necessary, and enjoy!! Perfect , plain and simple. Great pattern that lets the yarn steal the show. These gloves look great! I’m trying to knit them for my girlfriend, but I’m having a hard time figuring out the thumb…I left those 6 stitches knitted with scrap yarn and I don’t know where the 11 come from when I come back later to it? Am I not doing something right with the “knitting over those stitches” part? I’d be happy to call you if it requires more of an explanation. Just let me know. THank you! I was wondering if you would be willing to let me print and share your pattern at a beginning spindle class I teach. If you do not agree, I completely understand and will rig up a pattern on my own. Just what I was looking for, thanks so much. I don’t have homespun wool though. I am just learning and wouldn’t even know how to make home made spun wool. I sound really stupid but I got to learn somehow. Again thanks for pattern. Don’t know if it well work on ordinary bought wool??? 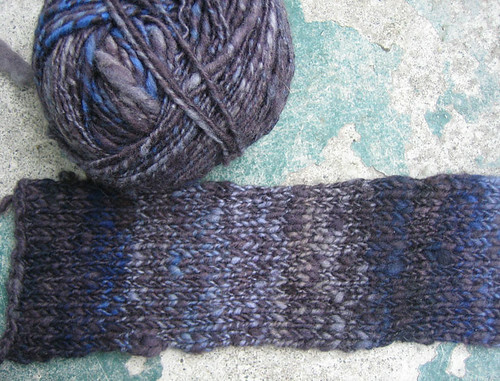 Yvonne – any yarn will work, it doesn’t have to be handspun. A yarn that knits to 18 sts / 4″ or 4.5 sts/inch or thereabouts would work fine. Very nice gloves! I have some handspun I need to knit up. This might be just the thing.